Who’s behind the artwork that the VHP sells and displays? In this new blog feature, you’ll have the chance to learn a little bit more about the spectrum of artists whose work is presented by the VHP. These artists come from a broad range of backgrounds, and their biographies are as vibrant as their colorful paintings. This week we’re profiling Reynald Joseph (b. Port-au-Prince, 1973), whose lively piece Jammin’ served as the iconic poster art for the VHP’s Les Petits Chanteurs event in September. Joseph’s father, well-known Haitian artist Wilfrid Louis, first inspired him to try art when he was a boy. Louis continued to serve as a mentor as his son launched an art career of his own. Today, Joseph has developed his own distinct style and flair in his art. 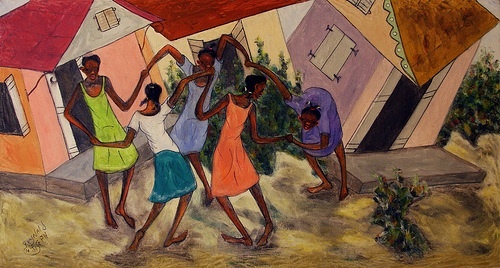 He often paints native Haitians just plain having a good time, whether they’re dancing, making music, playing games, or sailing. There is a great sense of movement and celebration in Joseph’s work. His lanky, playful figures exude a contagiously carefree attitude. Reynald Joseph also appeared in a Washington Post article on Haitian artists coping with last January’s earthquake. Joseph was one of many artists to tenderly portray post-quake Port-au-Prince in his art. Joseph is immensely popular at the Galerie Monnin, and is among Haiti’s most beloved, distinctive artists. R.J.’s vibrant colors reminds me of all the sunlight, lots and lots of light there, which makes colors always more vibrant and therefore makes Haitians love color. Through this wonderful Haitian I get to appreciate ” the living color of daily life all the more. I also liked the artists used in Kendell’s music piece. What are the names of those artists and will you be presenting them soon> artists musician Kendell used in her original piece written for VHA. Brava,Kendall and thank you. Humanism, beauty, soulfulness, nature all captured and appreciated on this blog. Thanks to all. Keep up good work. PS Enjoyed all who spoke on VHP Intro Piece, and esp Mr Tan’s closing remarks.